Equipment, desk, or meeting room bookings can be edited with the My Bookings tool. 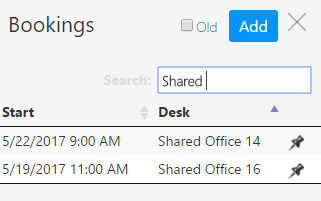 A user with permissions to book desks will have this tool available to them. If you are logged in as user with permissions to book desks, open the Sidebar Menu and select My Bookings. Select and delete an existing booking. From the My Bookings panel, type a search term into the quick search field. The search results will dynamically update as search terms are entered. Click the Add button in the My Bookings toolbar. Select the Desk field to choose which desk you wish to book. Select the Date field to choose a day for the booking from a calendar interface. Select Confirm to save the booking. Select the booking you wish to delete from the My Bookings list. Select the Delete button in the Booking panel. Confirm in the booking deletion popup that you wish to permanently delete this booking.